The Versa Flow was designed to be as versatile as you. Add a 3L Top Fill Reservoir and it becomes the ultimate hydration tool that easily adapts to your lifestyle. Combining the Versa Flow as an inline filter allows you to use it with your hydration pack or used as a gravity system. Although it is lightweight, the Versa Flow is heavy in features. Every filter is built to exacting standards and exceeds EPA standards for filtration. The Versa Flow has many tiny tubes called hollow fiber. Hollow fiber works through size exclusion. Meaning the hollow fiber tubes have thousands of tiny holes (0.1 microns) that block 99.9999% of harmful bacteria, Giardia, E. coli, protozoan cysts, Cryptosporidium and more. All of these organisms are too large to fit through the 0.1 micron holes. Some manufacturers filter the water through the core of the hollow fiber tubes, but this restricts water flow because only so much water can fit through the core opening. We filter water through the outside of the tubes by bending the hollow fiber. This dramatically increases the surface area and flow rate of the filter while protecting the filter integrity itself. If the core of the tubes become clogged from sediment on the competitor's filter you can no use the filter. The Versa Flow allows you to be able to backflush the filter, clearing out all of the particulates and increasing the lifespan of the filter. If you consistently backflush the filter you can use it almost indefinitely. This means no additional filters, cartridges, pumps, iodine drops, or batteries to ever buy again. 99.999% BACTERIA PROTECTION - The Versa Flow water filter has a Hollow Fiber Membrane measures 0.1 microns which removes 99.999% of harmful bacteria, Giardia, E. coli, protozoan cysts, Cryptosporidium and more. EASY TO USE - The simple designs allows you to have clean water by simply filling up your water bladder and begin drinking. The 3 liter reservoir top fill style allows for easy filling, cleaning, maintenance, and accessibility. LONG TERM & LIGHTWEIGHT - The Versa Flow will last up to 10,000 gallons and can be easily cleaned so through simple back-flushing and it only weighs 2 ounces. 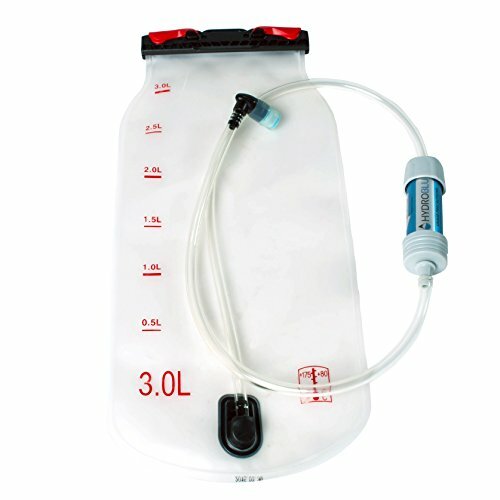 The 3L top fill weighs 12 ounces allowing you to carry water with filter system for less that 1 lbs. EVERYTHING YOU NEED - Traveling in the wild of the urban jungle this water filter with hydration water reservoir are the ultimate protection against dirty water with the Ultra-Filtration technology with the Versa Flow and 3.0 liter top fill hydration bladder. LIFETIME QUALITY - All of HydroBlu products are designed in Salt Lake City, UT and come with a lifetime warranty. As a US based company they will support their products. If you have any questions about this product by HydroBlu, contact us by completing and submitting the form below. If you are looking for a specif part number, please include it with your message.